Looking for careers that will keep your wallet and your soul full? Check out these jobs for creative people. Creative jobs encourage you to think way outside the box. Creative jobs may bring to mind painting and acting, but there are scores of careers that rely on imagination as much as skill. 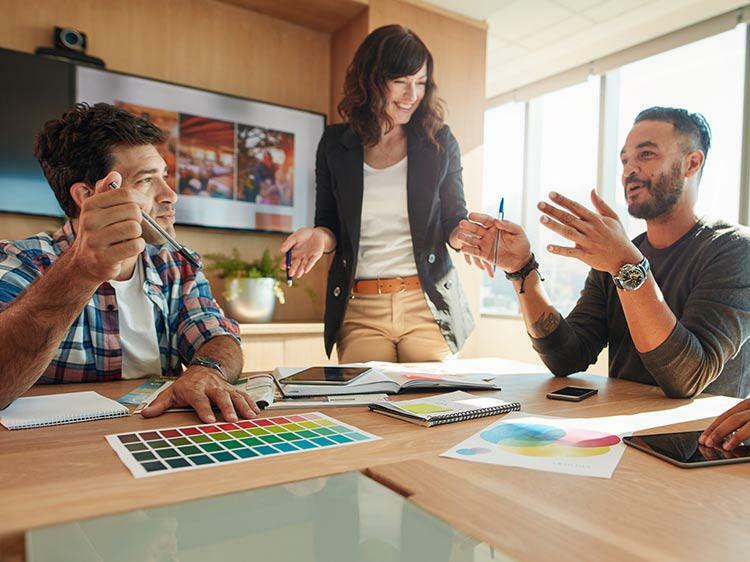 According to a study by the World Economic Forum, creativity will be the third most in-demand employee skill by 2020. With companies on the hunt for creative talent, it’s very possible you can get hired to think way outside the box. Based on Bureau of Labor Statistics data, Monster found 10 creative jobs that will fulfill your soul—and bank account. What you’d do: Love working in different types of media to tell a compelling story? Becoming an art director might be the perfect career path for you. Art directors control the visual look and feel of media like magazines, films, and product packaging. Some work for brands, others for agencies. What you’d need: Art directors typically have a bachelor’s degree in an art or design field. Since it’s a visual line of work, building a powerful portfolio and having the proper art director resume will play a key role in landing a job. Find art director jobs on Monster. What you’d do: From Bobby Flay to Rachel Ray, celebrity chefs have achieved rock-star status are celebrated across the world. But glamor aside, even a low-profile chef gets to experience the joys of experimenting with flavors and textures to serve and delight customers. What you’d need: On-the-job training as a line cook is common, though a degree from a culinary school can make it easier to get your foot in the door. Find chef jobs on Monster. What you’d do: Copywriters do exactly what it sounds like—write copy. You might be writing for a brand website, a blog, or creating advertising copy for a variety of media, such as social channels, email marketing, and more. You’ll need a knack for writing concise, original, and clever copy so that the messaging sticks with readers. What you’d need: Most companies hiring copywriters require a bachelor’s degree in a related field, such as writing, publishing, or marketing. Find copywriter jobs on Monster. What you’d do: Editors work for brands, publishing and media companies, magazines, and more, making sure copy is on-brand and publish-ready. Digital editors often work with teams of freelancers and in-house experts to edit blog copy and marketing materials. What you’d need: Since most editing is web-based these days, a familiarity with publishing software and content management systems is helpful (WordPress, for example). Most companies look for candidates with bachelor’s degrees in fields like English, writing, and communications. Find editor jobs on Monster. What you’d do: Florists design flower arrangements for a variety of occasions—weddings, graduations, corporate events, and more—dreaming up different combinations of colors, sizes, and shapes. What you’d need: Most floral designers learn on the job (no bachelor’s degree required). Inventiveness and attention to detail are good traits to have. Find floral designer jobs on Monster. What you’d do: Find yourself constantly rearranging your home, picking up accent pieces, and changing color schemes? Might be a sign you’re meant to be an interior designer—a career where you help clients create appealing living and working spaces. What you’d need: Most interior designers will have a bachelor’s degree in a design-related field. Again, creating a portfolio of spaces you’ve designed will help show prospective employers and clients your talents. Review a sample resume for interior design. Find interior design jobs on Monster. What you’d do: Through demonstrating the power of music, these therapists touch the lives of people who need it most (in rehabs, hospitals, and hospices, to name a few work environments). Music therapy involves performing music and sometimes inviting patients to participate as well. What you’d need: A bachelor’s degree in music therapy, occupational therapy, recreational therapy, or a related field is a typical requirement. Some employers may also require certification or a license in music therapy, CTRS, or art therapy. Find music therapist jobs on Monster. What you’d do: Many types of photography exist—sports photography, landscape, portraiture, photojournalism, and others. But no matter the discipline, photographers try to get the best shot possible by combining technology with ingenuity. What you’d need: Depending on the type of photography you pursue, you might need a bachelor’s degree (in industrial of scientific photography, for example). Review a sample photographer resume. Find photographer jobs on Monster. What you’d do: The best websites seamlessly combine creative design and functionality. You can thank the UX designers (user experience) for that. They work on websites or mobile applications alongside project managers to deliver wireframes, information architecture, and visual designs that will later become live environments—like this webpage you’re reading right now. What you’d need: A bachelor’s degree in design, web development, or a related field is a good start. Knowledge of HTML, CSS, and the Adobe Creative Suite (Photoshop, Illustrator, etc.) is also preferred. There are different approaches for a UX designer resume, depending on whether you’re entry level, midlevel, or experienced. Find UX designer jobs on Monster. What you’d do: Get paid to play. As a video game designer, you’ll be designing, prototyping, and producing game experiences. This could be for smartphones, computers, consoles, or even virtual reality. What you’d need: Game designers usually have a bachelor’s degree in computer graphics or design. An interest in video games and experience working cross-department are helpful in applying (since game designers work closely with engineering, audio, and other teams). Find video game designer jobs on Monster. Get creative with your job hunt. Join Monster today. As a member, you’ll get job alerts sent directly to your inbox, cutting down on the search time. You can also upload your resume and make it visible to recruiters who scour Monster every day looking for unique talent just like you.